Beginning in the 19th century, the investigations of researchers from various backgrounds including scientific, archaeological, ancient historic and spiritist saw the crystalization of theories around the subject of a lost continent. Lemuria was first theorized to have been in the Indian Ocean by 19th century biologists and geologists to account for the existence of Lemurs and similarities in geological features in distant places from Africa, India, The Malaya Peninsular and Madagascar. Among such theorists were William Blandford in 1860 and English zoologist Philip Lutley Sclater in 1864, who gave it the name of Lemuria in a scientific journal article. The same name was later adopted by biologist Ernst Heinrich Haeckel. The origin of these theories may be attributed to surviving historical and mythical references to an ancient sunken land in various cultures, such as the Popol-Vuh of the Mayan, and Rig Veda of Ancient India. 19th century investigators such as Charles-Etienne Brasseur de Bourbourg and Louis Jacolliot, proposed the existence of ancient sunken lands in various locations based on these ancient accounts. In 1864 Brasseur coined the name "Mu" by using two symbols "M" and "U" from a Mayan manuscript (later disregarded by scholars studying Mayan hieroglyphs) to come up with the name of a lost continent. It seems a coincidence that Lemuria has the syllable of Mu in it, given the diverse origins of each name, in any case the names became interchangeable. In 1874 Louis Jellicot published Histoire des Vierges: Les Peuples et les Continents Disparus, in which he examined one of the most ancient legends of India, preserved in the temples by oral and written tradition. This legend relates that several hundred thousand years ago, there existed in the Pacific Ocean an immense continent which was destroyed by a geological upheaval, and that the fragments would be found in Madagascar, Ceylon, Sumatra, Java, Borneo and the main islands of Polynesia. Founder of Theosophy, Helena Blavatsky mentioned Lemuria in "Isis Unveiled" in 1877, suggesting various locations including the Atlantic and Pacific Oceans: "The Pacific also shows signs of having been a populous island-empire of Malays or Javanese--if not a continent amid the North and South. We know that Lemuria in the Indian Ocean is a dream of scientists; and that the Sahara and the middle belt of Asia were perhaps once sea-beds." Expounding further in her book "The Secret Doctrine", published, 1888 she claimed the existence of Lemuria was revealed to her by the Indian mahatmas and the "Book of Dzyen". This also included the existence of Atlantis, which was supposed to have been a peninsula of Lemuria that extended from the Indian Ocean into the Atlantic Ocean. According to Blavatsky, Atlantis was supposed to have not sunk until many thousands of years after Lemuria. 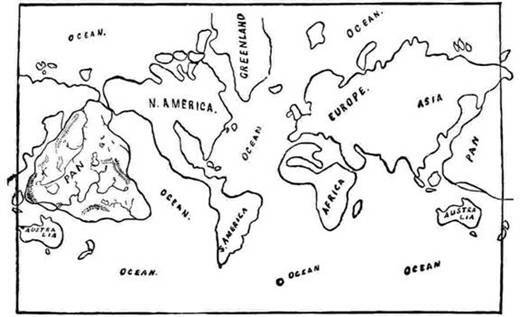 The more widely read references to Lemuria or Mu being located in the Pacific came much later, James Churchward articulated the Pacific location in 1928 and published, in 1931, "The Lost Continent of Mu". Churchward's account is similar to Blavastky's in many respects. Neither of them included Japan as a remnant and they both describe partial sinking of the continent and the remainder sinking later. Moreover, none of the 19th century Lemuria/Mu researchers include Japan either. Churchward locates Mu in the South Pacific extending from Fiji, to Hawaii and South Pacific Islands, and in his version, however, there were no mountains in Lemuria. On the other hand, Oahspe was clear about the mountains of Pan, particularly those in the north where Japan, the northern remnant remained above the ocean. "Zha'Pan [in the original Pan language] is the same country that to this day is called Japan, signifying, RELIC OF THE CONTINENT OF PAN, for it lay to the north, where the land was cleaved in two. "Oahspe, Bk of Aph, 11/1.55. Oahspe's Pre-Flood map of the world showing the location of Pan indicates mountains in places where there are now islands. For example where the Hawaii Islands and undersea ridges are found on modern day maps, on the map of Pan we find mountain chains. (See other articles on Pan, the Submerged Continent in the Oahspe Study index.) Also, geological analysis of the earth's crust beneath large areas the Pacific Ocean reveals that it is continental crust rather than oceanic crust. For example, thickness and sub-aerial weathering indicate that vast areas of now submerged land had once been above water. This, of course, again, shows that Oahspe independently revealed, for the first time in 1882, substantial facts that are only now being proved by modern day technologies such as satellite imaging and sonar underwater mapping and seismology detecting large quantities of water under the eastern Asian land mass. Even simple scuba diving technology allowed fantastic discoveries of manmade structures off the coast of Japan. In 1985, off the Island of Yonaguni, an ancient pyramid structure was discovered and consequently, more structures in the area, as well as tools used to hew the rocks (See and Japan Undersea Ruins). In response to the 19th century hypothesis of Lemuria to explain similarities in species and geology, scientists declared that a continent cannot be sunk (which would be true if it were only geological forces at work, Oahspe, however, reveals the intervention by ethereans, progressed souls from the unseen etherean worlds beyond the earth's vortex, capable of wielding enough force to sink a continent). The scientific knowledge today proves that Pan could only have been sunk by other than geological forces. And these forces had to be wielded purposely by intelligent beings with sufficient power, such as the Ethereans which Oahspe describes. The subducted plates and the deep trenches and fracture zones surrounding the triangular shape of the sunken continent and surrounding the area are not yet properly understood by scientists, but do accord with the description of the sinking of the mighty continent. (See Book of Aph extracts below). OAHSPE, Book of Aph, 10/3.16-20, 10/6.1-9. || Quickly, now, the ships of fire formed in line, extending from my place down to hada, where Neph and his Lords of the earth rested, whose hosts extended to all the divisions of land and water, embracing the various heavenly kingdoms previously built by the Lords. And in the line of the etherean ships the plateaus of rank were stationed; and the hosts of Gods and Goddesses took their places, according to the rank of wisdom, power and love manifested in the etherean departments from which they came; with the two Orian Chiefs at either extremity. And I divided the line into sections, each with two hundred and fifty ships, and there were one thousand sections. And every ship was contracted ten thousand fold, which was the force required to break the crust of the earth and sink a continent. Along the line I stationed sentinels and talesmen, and inexhaustible numbers of messengers so that Jehovih's voice and His sons' voices could traverse to every part in a moment of time. And after that I formed the tube of transit, which extended in front of the ships, and from the earth to beyond Chinvat; and I filled it with the earth's atmosphere even up to the high end, where it joined Io'sank, where I planned to deliver the drujas and fetals of those who were to perish in the ocean of the earth. || And now Aph, Son of Jehovih, said: When the etherean hosts were arranged in due order, I called out to You, O Jehovih, saying: In Your Strength and Wisdom, O Father, join the heavens above with the earth below! And the end of the etherean column that extended to Chinvat, on the border of the vortex of the earth, was made secure by the pressure of Your wide heavens. Again I said: In Your Strength and Wisdom, O Jehovih, join the heavens above with the earth below! And the end of the etherean column that extended down to the earth was made secure around the borders of Whaga, by the sea and the high mountains to the north. Again I said: O Jehovih, deliver the earth from evil, for Your glory, forever! And the vortex of the earth closed in from the rim, and lo, the earth was broken! A mighty continent was cut loose from its fastenings, and the fires of the earth came forth in flames and clouds, with loud roaring. And the land rocked to and fro like a ship at sea. Again I said: O Jehovih, deliver Your heavens, which are bound like a chain, to a rotten carcass. And again the vortex of the earth closed in on all sides, and by the pressure, the land sank beneath the water, to rise no more. And the corporeans went down to death; and the fetals and familiars gave up the battle; neither did they have anywhere to stand, nor did they know how to go to any place in all the heavens, but were lost and crying out for help. Origins of the words "Lemuria" and "Mu"
|| References to the lost continent of Mu can be traced back to 1864 and a French archaeologist named Charles-Etienne Brasseur de Bourbourg. He had become fascinated by hieroglyphics found on Mayan ruins that dated back several centuries. By the time Spanish explorers had reached the New World areas of Mexico and Central America in the 1500s, the great centers of Mayan civilization had long been abandoned and were being reclaimed by the rainforest. Brasseur traveled to Spain to look at artifacts of Mayan civilization. In a library in Madrid he discovered a purported guide to Mayan hieroglyphics. Using the guide to decipher a rare Mayan manuscript, he learned about an ancient land that had sunk into the ocean after a volcanic eruption. Figures corresponding to letters "M" and "U" were connected with the lost land, and Brasseur determined that the lost continent was named Mu. Using that same guide, however, later scholars were unable to decipher such a story, or to even make sustained and meaningful text from the hieroglyphics. It was not until the mid-twentieth century that a thorough guide to interpreting Mayan hieroglyphics was established. Nevertheless, Brasseur's version of a lost continent won some favorable attention. An archaeologist named Augustus Plongeon (1825-1908) used a similar key to decipher hieroglyphics at one of the first excavations of Mayan sites. He allegedly uncovered a story about two brothers who vied for a queen named Moo (which he connected with Mu). One of the brothers was killed, and the other took power just before a catastrophe struck Mu. Queen Moo fled before the catastrophe. Speculations quickly added that she had reached Egypt, became revered as the goddess Isis, founded Egyptian civilization, and directed the building of the Sphinx. In the mid-nineteenth century, Charles Darwin's (1809-1882) theory of evolution, Origin of the Species, was published. Although the theory became widely accepted among scientists, it was also extremely controversial. One point of contention concerned an animal and layers of sediment found in South Africa, the island of Madagascar, and India, all of which are in the same region but separated by expanses of water. The lemur, a predecessor of monkeys, had the same traits in each locale. According to Darwin's theory, the animal should have developed some unique traits respective to the different environments. Similarities in sediments in each of the areas also raised questions. Scientists began to speculate that a land bridge once existed in the Indian Ocean that connected the three areas. English zoologist Phillip L. Sclater/Schlater proposed the name Lemuria after the lemur for this former land now sunk in the Indian Ocean. The land bridge idea was supported by noted scientists, including German naturalist Heinrich Haeckel (1834-1919) and Alfred Russell Wallace (1823-1913), who had developed a theory of evolution similar to Darwin's. Seas and continents were thought to be immobile in those days before the theory of continental drift, and no fossils of early humans had yet been found. Haeckel used Lemuria, which had sunk into the sea, to explain the absence of early human fossils. Lemuria became a respected term among educated people in Europe and America. Where did James Churchward get his basic ideas for "The Lost Continent of Mu"
According to James Churchward himself, in his original book, "The Lost Continent of Mu: The Motherland of Men" published in 1926, he claims to have received the knowledge through deciphering (with help from an old Indian priest) some ancient Indian tablets which were in a very ancient language which only two or three people in all of India could read. Five years later he published "The Lost Continent of Mu" in 1931. This was essentially a rewrite of the first book with additional text and images. Note: The Algonkin [sic] Indians have a tradition as told by John Ballou [sic] in his Oahspe about the Flood and the submersion of Mu --- called Pan. As related in this book the tradition is actually two traditions in one. "The Algonkin [sic] Indians had a warning of the Flood and were building ships in which to escape. 138 ships of the deluge set out from the Continent of Pan (PAN)." Attached to and directly following this is: "In the same day the gates of heaven and Earth were opened." "And the earth rocked to and fro, as a ship oat sea, and the rains fell in torrents and loud thundering (earthquakes) came up from beneath the floor of the world. And the vortex of the earth closed from the extreme, and lo, the earth was broken! A mighty Continent was cut loose from its fastenings, and the first of the earth came forth in flames and clouds with loud roarings. And the land rocked to and fro like a shop at sea. And again the vortex of the earth is [sic] about on all sides, and by the pressure the land sank down beneath the water, to rise no more. " Oahspe, Book of Aph; 10/6.1- 10. And now Aph, Son of Jehovih, said: When the etherean hosts were arranged in due order, I called out to You, O Jehovih, saying: In Your Strength and Wisdom, O Father, join the heavens above with the earth below! And the vortex of the earth closed in from the extreme, and lo, the earth was broken! A mighty continent was cut loose from its fastenings, and the fires of the earth came forth in flames and clouds, with loud roaring. And the land rocked to and fro like a ship at sea. And again the vortex of the earth closed in about on all sides, and by the pressure, the land sank beneath the water, to rise no more. And the corporeans went down to death; and the fetals and familiars gave up the battle; neither did they have anywhere to stand, nor did they know how to go to any place in all the heavens, but were lost and crying out for help. Of druj and fetals, there were sixteen billion six hundred million. Many of these had lived on earth as fetals and druj for thousands of years, although many others of them were not capable of everlasting life. Next, of the first resurrection there were thirty six billion; and of the second resurrection, three hundred and five million. But during the last hundred years, the earth brought forth no one capable of everlasting life except, indeed, the remnants of I'hins. The Lord's First Book; 11/1.39 - 45. And the angels of heaven numbered the ships, and there were one hundred and thirty eight. And the ships stood on the mountains and in valleys; but of all the ships that had been built, not one stood near the waters. And the earth stood in the arc of Noe in the firmament of heaven, in the place and grade of six hundred in the a'ji'an roads, twenty-four thousand years before kosmon. And the Lord commanded the chosen to go into the ships; which they did; and in the same day the gates of heaven and earth were opened. And the earth [that was the land of Whaga] rocked to and fro, like a ship at sea; and the rains fell in torrents; and loud thunderings came up from beneath the floor of the world. And the sea came up on the land; first upon the valleys and then upon the mountains; so that the ships floated on the waters. But the land was swallowed up, valleys and mountains; and all the living (on Whaga) perished, except the I'hins, who floated off in the ships. And the Lord said: I numbered those who were saved, and there were twelve thousand four hundred and twenty; and these were all that remained of the first race of man that walked on two feet. • Firstly, John B Newbrough is not John Ballou. Ballou was Newbrough's middle name, named after a well known Spiritualist of those times, John Ballou. One wonders whether this was a deliberate error to obscure the original reference to the lost continent in the Pacific. • Secondly, the quoted Oahspe text is inaccurate, with additions as well as important missing text, changing the context and meaning to that in Oahspe. • Thirdly, Churchward's explanation of the origin of the legend, as well as the Oahspe misquote implies that Newbrough was retelling an Algonquin legend. But Newbrough was neither retelling a legend, let alone an Algonquin legend, nor was he the author of the account of the sinking of Pan in Oahspe. Whether or not the Algonquins had the very same version of the submergence of Pan is at this point irrelevant, since Algonquins were not mentioned by either Newbrough in any footnote about Pan's submergence, nor was there any reference to Algonquins on Pan at the time of the "flood" in the Oahspe text. Algonquins (the people of Agoquim/Egoquim), as a tribe or nation of people did not exist until many thousands of years after the submergence of Pan! Having cleared up the misquotation of Newbrough and Oahspe, we still have the issue of where Churchward got his information. Until recently there was no available evidence to support or refute whether or not he was truthful about his narrative of having deciphered ancient tablets in Central India under the guidance of a Rishi priest who had special ancient knowledge required to read the tablets. But recently, in March 2016, Churchward's great-grand son, Jack Churchward, published some telling information that puts into question the validity of Churchward's narratives, particularly his original source. His story in the main was the same as Le Plongeon's. It was what we discussed with the old professor Augustus Le Plongeon and his young wife Madame Alice Dixson Le Plongeon in my home in those early days when I had introduced them both to my friend Churchey, to King Gillette and others. || My Friend Churchey and His Sunken Island of Mu, 1936, unpublished, pages 215-216. These passages do not appear in the published version. Oahspe was the first published source that placed a submerged continent in the Pacific, with details beyond anything published before, nor since. While other researchers of the 19th century surmised lost continents prior to Oahspe's publication in 1882, none were thought to be located in the Pacific prior to Oahspe. Since Churchward, himself, quotes Oahspe (although misquoting and deliberately omitting the important details of how, who, and why, Pan was sunk), it is entirely possibly that he found inspiration for his version of Pan from Oahspe. Oahspe was well known at the time of its publication, having been favorably reviewed by famous researchers of ancient languages and cultures. Churchward did write that he had examined many sources which were not all named in his books. But we who have read Oahspe, knowing the great amount of relevant information it holds, wonder how he could have committed such a monumental oversight as to not even mention Oahspe as providing the location and extent of Pan. Even if he only believed part of the revelation or questioned the source, would he have not still marveled on how Newbrough came to produce this knowledge? Why Churchward hid the extent of Oahspe's revelation of Pan in his note of misquotation, essentially reducing the Oahspe's Pan into a retelling of a Native American legend, is anyone's guess and still Churchward's secret. Now, having presented a more accurate account of Churchward's Mu, painful as it is to expose flaws that need to be exposed, we can still appreciate Churchward's contribution which is important and more significant than any shortcomings. At the very least, Churchward popularized and built upon the concept of a prehistoric sunken continent in the Pacific Ocean, bringing this vision to many who otherwise would not have known of it. · RETURN TO STUDY INDEX . Japan Undersea Ruins, Remnants of the Continent of Pan .